Hey! How's that horticulture going? Better, but you'd still welcome some more practical tips? I knew it. It's all very well to say "don't stress" and "choose wisely," but then what? Sooner or later you'll have to get down to business, plunge your hands into the soil, and... go back on the Internet looking for answers for all those new questions you now have. But don't worry, 'cause I'm here for you. One of life's great tragedies is that not everyone can have a beautiful and slightly spooky Kew-Gardens-Grade walk-in conservatory (greenhouse) in art nouveau style. Some of us have to make do with other things. These other things may not be as pretty or impressive, but they get the job done and they will be a tremendous help to you, especially if you live in slightly colder climes. 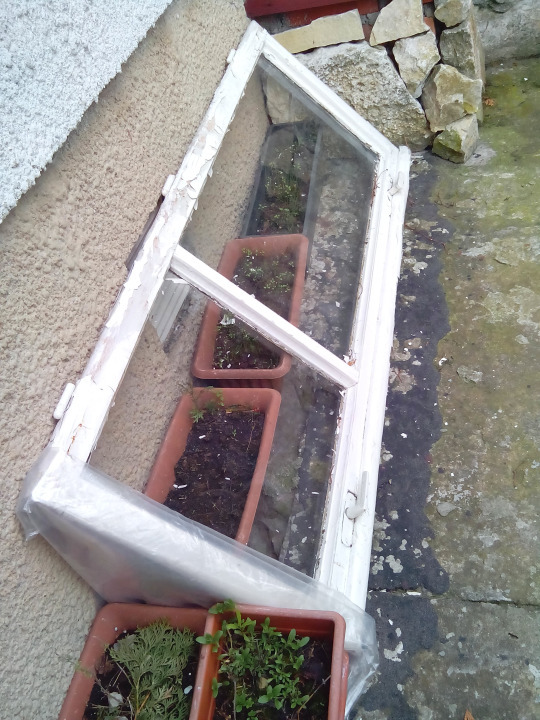 These three types of DIY conservatory I've used are all effective, work for small spaces including balconies and windowsills, and they come with bonus upcycling. My mother's house got new windows last year (finally!) and instead of throwing the old ones out, we used them to make this small plant nursery thing. It works great. All you have to do is find a spot with a sensible amount of sun, and secure the windows so they don't move. Then cover the sides (in our case, with a sturdy plastic sheet, but a bit of a board or old tiles or whatever work just as well). The point of a conservatory is to keep warm inside so you can't leave a gaping hole in there. 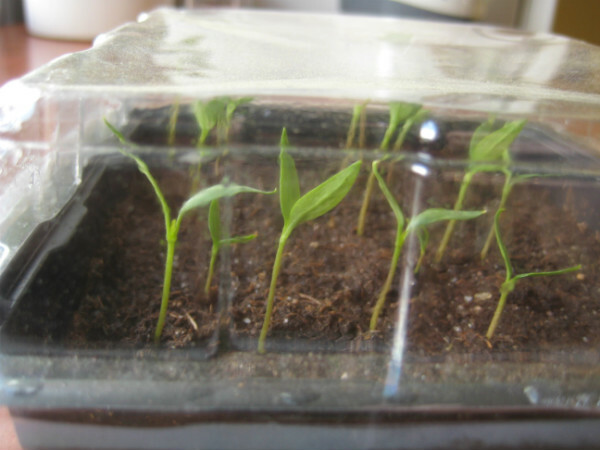 A really simple and effective way of helping your seeds out is to simply get a container of transparent, colourless plastic, and upturn it onto a flowerpot. That's it. Instant conservatory. You only have to remember to match the size and shape of the thing to your pots, because any gaps will let the heat out and defeat the purpose. And when too much moisture collects on the inside, you have to wipe it off. This is a way to have an individual mini-conservatory for a single plant. It's a good idea when you've brought it from a nursery, planted it in one of your pots, and don't want the transition to be too harsh for it. You simply take a transparent, colourless bottle of a desired diameter and cut it to the desired height. 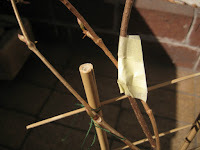 Then you pop it down onto the plant, taking care not to tear off anything. The advantage of this system is that you can open/close the cap to let moisture evaporate easier on hot days, or even to water the plant. This is also a great way to apply pest control sprays only on the one plant that needs it, and prevent the pests from spreading out, or at least makes it more difficult. Sort of a quarantine chamber. Note: your home conservatories don't have to be DIY. If you feel like it, go ahead and buy the adorable things available at shops. Whatever you prefer. Homemade stuff is great, but not all of us have the time and the knowledge to make it right. Or the facilities. Concocting the organic pest control spray from fermented nettle leaves will not be easy if you rent out a room from a cranky landlord. Plus, various plants do have various needs and you may be able to save yourself a big headache if you just buy a dedicated fertiliser that was composed for the specific plant and its needs. for aromatic herbs especially, choose dedicated fertilisers "for herbs." It sounds like a silly cash grab, but other such substances can and did change the taste of my herbs, whereas a dedicated one didn't. Good drainage is when the excess water from your plant can flow out of the soil and elsewhere, to evaporate and/or be drank up by the plant later, when it's done with what's in the soil. Only plants native to swamps and tropics handle soggy soil and too much water well - for the rest of them, their roots will rot and the plant will wither and die. 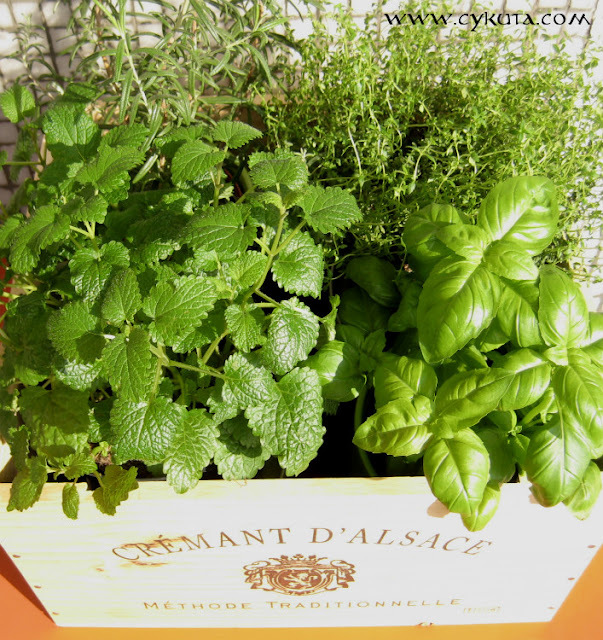 The best way to provide drainage is to plant the herbs in something that has holes in the bottom, and put that in another receptacle that will catch the water as it flows out. This can be a saucer, or a tray, or another, bigger pot. Whatever you prefer. Personally, I plant mine in simple plastic containers with holes, and put those in pretty pots and old tea kettles and vases and whatever tickles my fancy. If you absolutely cannot have holes in the bottom for whatever reason, then start the planting by making a thick layer (at least 3-4 cm) of gravel, expanded clay or similar material at the bottom of the pot. Put the soil and the plant on top of that. Don't use sand for the purpose because it's too fine. Except for plants that explicitly like being doused in water or sprayed, most of them prefer to draw the water from the ground up. Like they do naturally. 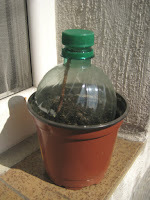 It's much better to supply your plants with water from underneath, so that roots are forced to burrow for it and can expand and keep the plant upright. If your plant always gets its water from the surface, all the roots will be near the surface too. This is easily done when you have holes in your pots, as per #3. You just pour the water onto your saucer or into the outer pot and are done with it. In other cases, you may have to dig a small hole somewhere to the side of the pot so that the water flows into it. You can also stick a "pipe" into the soil (a bit cut off from a garden hose, for instance) and pour the water into it, let it seep into the soil that way. Not all plants will like that, though - for some, this can make the soil too cold for their roots, for instance. It's tempting, especially for people who flirt with the whole Mother-Nature Druidry Cottage Herbalism thing (and that's certainly me and probably some of you, too) to leave the plants to their devices and let them do their thing. And for many plants, this can be totally OK, but every once in a while you'll have those that do need to be taken care of. If you see leaves are bitten and disappear at an alarming rate, it's no use hoping the plant can deal with it. You need to deal with the caterpillars for it. If you see leaves with signs of sickness on them, best tear them off and throw them away. 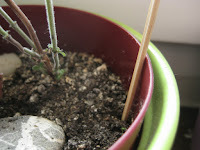 It may be a creeping vine in need of a frame to climb, or an overlong, thin stem that needs support. So give it some. You can buy frames and poles (usually of bamboo) in gardening stores, or you can use sturdy sticks you can find, or those thin bamboo skewers for the small pots. Avoid metal things because they may rust in the soil and the plant may not like it. When providing your potted plant with a pole, always stick the thing right next to the pot edge. It may seem a better idea to have it right next to the plant, but then you risk damaging roots. And if it's right by the edge then it's better stabilised. Sometimes, stems break, and then there's nothing for it but to put it in water and hope it will take root. But sometimes they only break a bit, hanging limply but with the inner fibers intact. In these cases, it may be worth it to use a bit of tape to patch it up, adhesive-bandage style, keeping it together. This happens quite a lot with my ampelopsis, and I usually wrap it with a bit of paper tape, putting a small bit of tissue over the tear just so the glue doesn't get into it. It may break your heart to cut bits off of a plant that is doing its best to grow, but sometimes this may be a good thing. Maybe a particular branch is too heavy, and the stem is sagging under its weight. Maybe you want it to branch out to the sides, too. Maybe a part of it is ill. If you need to cut up your plants, try to use as sharp a knife as possible so that you don't leave a jagged, haggard wound. Ookay, you may possibly know more than you wanted to now. Get planting!